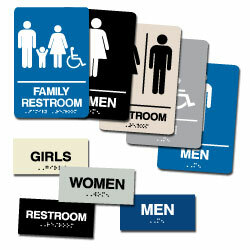 ADA Compliant Braille Signs by Street Sign USA! Braille signs make it easy for everyone to comply with ADA laws (Americans with Disabilities Act). Ideal for both indoor & outdoor use. Constructed from high impact polystyrene. For use in places where ADA signage is required. Each sign has up to 4 color schemes to choose from improving your architectural & design choices.